As the world continues to be in the grip of panic over the deadly Ebola virus, North Korea has taken drastic action to stop the disease from crossing its borders. Tour operators have said that the secretive Communist state is to ban all foreigners entering the country on tourist trips in case they may have the virus – regardless of where they have been travelling. So far, recorded deaths from Ebola are 4,877 with the World Health Organisation estimating that 10,000 cases were recorded by 19th October. However due to the more primitive administrative procedures in many rural areas in West Africa the real figure could be three times as much. “We have just received official news from our partners in the DPRK that, as of tomorrow, tourists from any country, regardless of where they have recently visited, will not be permitted to enter,” Gareth Johnson, of Young Pioneer Tours, according to the Metro. 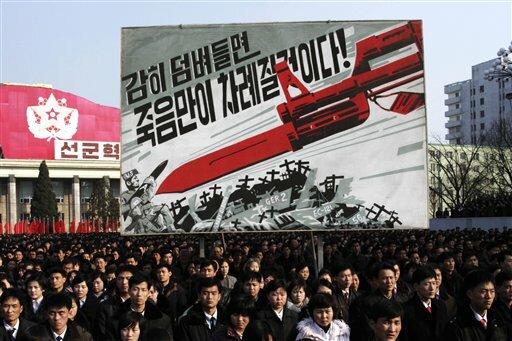 “It is unknown how long this closure will be in effect, and due to the very changeable nature of DPRK policy, we are still hopeful we will be able to run the three tours we have scheduled for the remainder of 2014,” added Nick Bonner, whose Beijing-based Koryo Tours runs trips to the region. Unsurprisingly, the country is not top on the list of tourist destinations for many people with visitors being allocated an official state guide to show them round at all times. The official news agency in North Korea, KCNA, said in late September there would be an increase in efforts to quarantine any foreigners or tourists who may be carrying the virus. In 2003, the country closed its borders due to the threat of SARS despite not a single case being reported there. North Korea has a national medical service and a health insurance system. The state insists that it provides universal health care for all citizens regardless of ability to pay, but this had been disputed by health professionals working abroad who say that such services only exist for those who can pay for them. In 2001 the World Health Organisation (WHO) said North Korea’s healthcare system was in a state of near-collapse. However by 2010 it said the healthcare system was “the envy of the developing world” in stark contrast to a report by Amnesty International which said there were “barely functioning hospitals”.